The central goal of Real Essays is to help students reframe writing as a skill essential to their everyday lives rather than just another stepping stone on their way to graduation. Built on the foundation of the Four Basics, the text guides students through the writing process, giving them technical skills, rhetorical knowledge, and creative confidence. 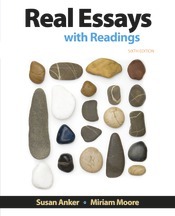 Real Essays helps students connect the writing class with their real lives and with the expectations of the larger world. This new edition breaks out types of writing by purpose as well as rhetorical mode, helping students discern what to write for which assignment, and includes professional model essays together with instruction, as well as in a separate reader in the back of the book. We have also added a "reflecting on writing" feature, giving students the opportunity to practice metacognition in their own writing, and updated the selection of model essays, including those by students. This edition can be packaged with LaunchPad Solo for Readers and Writers, which includes LearningCurve, the adaptive online quizzing program with immediate feedback. LaunchPad Solo for Readers and Writers provides instructors with a quick and flexible solution for targeting instruction on critical reading, the writing process, grammar, mechanics, style, and punctuation based on students’ unique needs.